Some Fonseca fans may compare its newest addition to the brand’s more intense Casa Magna. 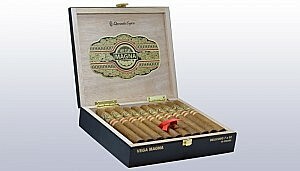 But although just as full-bodied, the Vega Magna is a slightly gentler smoke, featuring an Ecuadorian sun-grown wrapper and a filler composed of Dominican seco, viso, and ligero leaves that were aged in air-tight, palm frond tercios, an old Cuban technique that brings out the maximum flavours of these tobaccos, some of which are from the 2001 harvest. Three sizes are produced: 5 ½ x 54 Robusto, 7 x 52 Belicoso, and 6 x 50 Toro. Unique to the Vega Magna is its packaging, for each box of ten cigars encompasses a removable, framed and ready to hang laser-etched art scene by Dominican artist Pragmy Marichal that depicts various activities in the tobacco fields.